Since I began blogging again, I'm seeing a little AdSense revenue - few bucks a day. 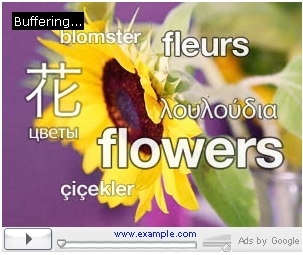 That develops my Google AdSense Stats Syndrome (G.A.S.S.) again! 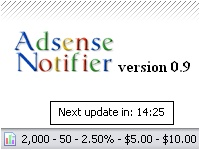 Had to reinstall the AdSense Notifier to save my time from logging into AdSense again and again. It's not a new thing on the web, but if you have not heard of it before, get it here: Adsense Notifier. Notice this tip from Google when I was checking my AdSense revenue. Make sure you check out this new program from Google. Basically, with this program, you'll be paid when your visitors click through to an advertiser's site and complete an action defined by your advertisers, such as a sale or sign up. 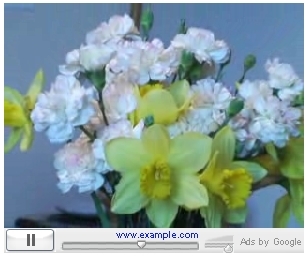 Of course, the pay per action will be much higher than a click in pay-per-click AdSense. It's still not open for everyone yet, but you can try to sign up, to be considered by Google. I just received a newsletter from Chitika, telling me that they have come up with a new advertisement unit, the Multi-Product Unit. As the name says, it's a single ad unit with multiple products in it. It's only available in the size of 468x180, which is why I don't put a sample here.